Dani Pedrosa set the pace as a dry afternoon on the second day of post-season MotoGP testing at Valencia allowed Marc Marquez and Bradley Smith to make their premier class debuts. For Valentino Rossi and Yamaha, however, the wait for dry weather running continues. The team travelled overnight to Aragon in a bid to give the Italian maximum seat time, only for difficult conditions to make the day an effective write-off. 2012 champion Jorge Lorenzo also suffered a minor fall at Turn 16, from which both he and his bike emerged unscathed. The second day at Valencia had also started in similar fashion, with only Aleix Espargaro and Andrea Iannone completing laps in difficult first hour conditions. Tech 3's Bradley Smith was able to join shortly after however, getting his first laps on grand prix machinery after being forced to sit out all of Tuesday. In the afternoon Valencia was finally dry enough for slicks leading to a rush or riders heading out - with Moto2 champion Marc Marquez on the works Honda among them. The Spaniard bedded in steadily, first completing a seven-lap run and eventually clocking 28 laps before the day's end. 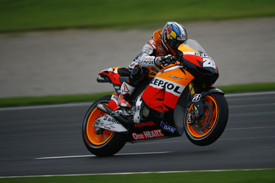 He improved consistently and eventually worked his way down to a 1m33.403s, just over one second down on his Honda team-mate and 2012 championship runner-up Pedrosa. The pair were separated by five other riders: Cal Crutchlow, Stefan Bradl, Nicky Hayden, Alvaro Bautista and Andrea Dovizioso. Crutchlow ended just over three tenths of a second down on Pedrosa, and just over 0.1s up on Bradl, newly confirmed as a Honda factory-supported rider at LCR until 2014. Nicky Hayden meanwhile edged out his new Ducati team-mate Dovizioso by just under three tenths of a second. Michele Pirro, Ducati's 2013 test rider, ended the day eighth fastest ahead of Iannone, riding for the restructured Pramac satellite squad. The Italian was the day's busiest rider, clocking up 56 laps. Aspar's Randy de Puniet beat Smith to 10th, while Karel Abraham, Danilo Petrucci, Hector Barbera and Espargaro rounding out the day's order.